Featuring specialist signal-blocking material within a highly durable, stylish pouch, you can rest assured that your key fob is protected from thieves and from scratches or cracks. Featuring a handy carabiner clip attached to the back, this pouch can be secured in place. 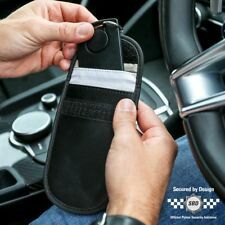 Featuring specialist signal-blocking material within a highly durable, stylish pouch, you can rest assured that your key fob is protected from thieves and from scratches or cracks. This size pouch is small enough to fit in your pocket or bag. To add to this, Disklok is accredited with Secured by Design, which is the effectively the Polices stamp of approval. Note: The storage case is designed to protect your Disklok from scratches and wear when not in use. Makers of the Disklok! See listing video for details! 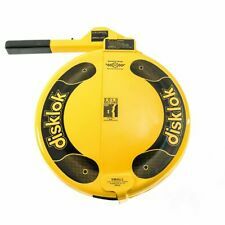 Disklok Security Storage Case Yellow Car Steering Lock Cover - Fits All Sizes! 5 out of 5 stars - Disklok Security Storage Case Yellow Car Steering Lock Cover - Fits All Sizes! 4 product ratings4 product ratings - Disklok Security Storage Case Yellow Car Steering Lock Cover - Fits All Sizes! In great condition with minor marks from use, in full working order! Disklok Steering Wheel Lock Clamp Small 35cm-38.9cm Silver RHD Anti Theft New..
To add to this, Disklok is accredited with Secured by Design, which is the effectively the Police Forces' stamp of approval. When fitted correctly, the Disklok should be loose enough to slide around on your wheel but not loose enough to lift off. 5 out of 5 stars - Disklok Steering Wheel Lock Clamp Small 35cm-38.9cm Silver RHD Anti Theft New..
38 product ratings38 product ratings - Disklok Steering Wheel Lock Clamp Small 35cm-38.9cm Silver RHD Anti Theft New..
Disklok Security Small 35 - 38.9cm Yellow Disklok Steering Wheel Anti Theft Lock. Condition is New. Collection in person only. Disklok Steering Wheel Lock. Genuine. Size Small. Thatcham Sold Secure. 2 x keys. Condition is Used. Fit steering wheel up to 39cm 15.25 inches, some scratches, good working order. Electronic hijacking of cars with keyless ignition is on the rise! Prevent yourself being a victim with this secure low-tech deterrant. It is a highly effective anti-theft device being one of the few steering lock devices that are Thatcham Approved. 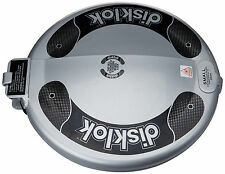 The disklok is in the discreet Disklok silver colour. 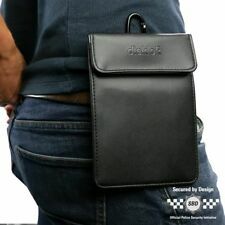 DISKLOK - Small fits up to 39 cm. 2 KEYS Used. Approx 10 years old. Condition is Used. Actually has 3 keys and not 2 as stated. Found other key. Good condition. Simple to use Bought in 2008 to fit a Mazda MX-5. It is a highly effective anti-theft device being one of the few steering lock devices that are Thatcham Approved. The Proven High Security Steering Wheel Lock. Fits standard steering wheels. Handle fold away. Simple to fit. When fitted correctly, the Disklok should be loose enough to slide around on your wheel but not loose enough to lift off. Wash Cloths & Accessories. Touring & Travel. Safety & Security. Motorcycle Accessories. Used two or three times only on my Defender which I have now sold, my Disklok Medium sized and fits steering wheels 39-41.5cm. Is now for sale. Still in its Original packaging, three keys and booklet, very clean hard to tell it is used. Dispatched by Royal Mail with tracking. New listingDisklok Steering wheel lock. Vehicle anti-theft. See Disklok website for spec. Google "Disklok UK". Disklok Steering wheel lock. Size: Large. Disklok Silver Small Disc Lock Disclock Disclok DisclockThatcham 3 35cm - 39cm. Condition is New.